Winter weather creates hazardous driving conditions. Have a car emergency kit for wintertime. Include at least a flashlight, blanket, snow/ice scraper, and sand or salt. Check out more tips for creating a winter car emergency kit here. Install fresh coolant before temperatures drop and keep your engine coolant system in the right proportion. Check your car owner’s manual to learn the proper way to change the antifreeze. Make sure your heater system and the window defroster are functioning properly. Check the windshield wipers and replace those that are worn or hardened. Use windshield wiper fluid that has antifreeze in it. Keep an ample supply of windshield washer fluid in your car. Ensure the battery is in proper condition to power up your car during freezing weather. Also examine the car’s charging system. Have your brakes serviced and checked for wear. Good brakes are especially important while driving on ice or snow. Use winter-grade oil that facilitates starting the vehicle. When the temperature falls below zero, use lower viscosity oil, like a 10-weight. Make sure your tires are not worn, are properly inflated, and have enough tread. Use all-weather tires or snow tires. 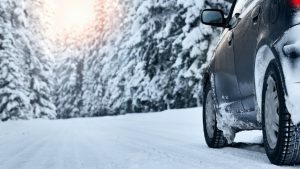 To improve your ability to control the car on icy roads, add tire chains on the drive wheels or on all wheels to maximize your control of the car. Keep your gas tank at least half-full to prevent fuel line freeze-up. Make sure to fill your gas tank before parking the car for a lengthy period. While driving, don’t turn on the heat too high; increased heat can make you drowsy. Instead, dress appropriately – wear extra scarves or mittens if you have to. Since roads are slippery in winter, remember to drive slowly and avoid hard breaking, fast turns, and quick acceleration. Driving also becomes more dangerous in winter because as the days are shorter, it gets darker earlier. This increases the risk of experiencing an accident.